She points out later in the book that her ideas do not pertain exclusively to writing, but extend to other talents and skills. Creative power and imagination is something we all possess. If we learn to trust ourselves we are able to take those potentials and use them to innovate. What does self-trust look like in a young child, an adolescent, and an adult? 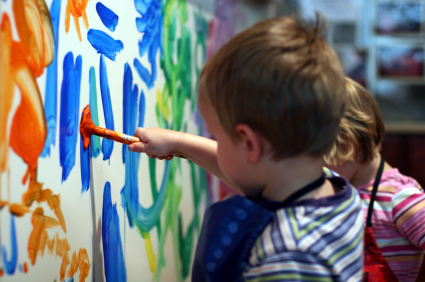 Children have a natural ability at an early age to use their creative powers and imagination in abundance. They typically are not held back by what others think of them. Ms. Ueland refers to examples of young children who engage in creative play “for nothing but fun, for that glorious inner excitement.” For children, play represents their creative power, their imagination at work. And make no mistake it is hard work and something that endures. For those who want to dedicate their lives to teaching creativity, it is extremely important to enter the creative quest themselves and find depth and transformation in their own process. Watch a short video of her explaining the importance of allowing children to engage in creative work and demonstrating how she accomplishes this in her painting workshops. Then watch this interesting video of a Japanese boy engaged in the creative process and how the adults around him respond. My interpretation of the video is that the young boy is creating something that does not conform to traditional rules of school, family and society. Adults don’t understand him. They try to dissect his work and confine his energy, but to no avail. The desire to create is in him, an inspiration, that only he understands. Until his teacher has a revelation, the puzzle becomes clear and adults begin to understand what is driving his energy to create. A Whale! So a question to ask ourselves is: how do we currently express our creativity or engage in creative work? If we struggle finding a satisfactory answer to the question, then it is likely we will struggle teaching our students creativity or allowing them time to be creative. We will be overcome by our obligations to have them finish “tasks.” I gather we have two responsibilities as educators: first, get in touch with our own creative energy; and second, we have to reflect on our lesson plans and intentionally design them to allow students sufficient time to create or think creatively. But this joyful, imaginative, impassioned energy dies out of us very young. Why? Because we do not see that it is great and important. Because we let dry obligation take its place. In schools, we usually confine our conversation of creativity to art classes? Why? As educators, are we so wrapped up in our obligations to quizzes, tests, and grades that we struggle to allow students time to create in our classes? It certainly is true that most teachers outside of art classes, do not ‘evaluate’ students based on creative or innovative work. If you have not watched Sir Ken Robinson’s 2006 TED Talk on how schools kill creativity, then you should spend 20 minutes viewing the talk below. If you have and remember his essential points, you will see how his basic premise mirrors what Ueland, Cassou, Sternberg, and other suggest we should do to promote creativity in our young people. It has to start with us getting in touch with our own creativity, placing value on spending time in creative thought in our classrooms, and trying not to ‘kill’ the creative spirit that lives in our students. We can start by reflecting on the nature of the feedback we give them. If you have thoughts regarding this post, please submit a comment. Great post. I wrote something related about how grading, especially too soon, hampers creativity. You don’t have a grade yet. It seems like getting in touch with one’s own creativity is a challenging task if you are teaching a fast paced AP driven course which seems to highlight (and allow time for) only one path to “the solution.” Is there a way around this? I would agree John. I have read your post on grading. It hit the target right in the center. It reminds me of our recent conversation about grading in my office. I know how much this issue is on your mind. I am most troubled by how the culture of school impacts student’s creative energy. We just don’t pay enough attention to it in school. Students need to find the creative outlets outside of our traditional classrooms, and yet inside these classrooms their creative energy has the potential to move the bar much higher. Why don’t we make space for them to create or think creatively. I do think so many adults are not in touch with their own creative spirit. We get so hung up on “obligations” to the status quo (tests, quizzes, reports, writing comments, meetings, etc.) that we get consumed by it. Little energy for anything else. Now, I know I am overreacting a bit, but I think unless we see the beauty of our own creative talents, we will not value setting aside time to develop it in our students. Thanks for commenting! How can we extend the conversation further out? I decided this year that, as an art teacher, I would do more to foster creative experimentation BUT no longer grade the students on creativity. I have seen the level of stress go down and the creative freedom in my classroom go up. I will say that in regards to students exploring their creativity outside of the classroom, this is a must. No matter what, creativity is experienced differently inside an institution vs. outside one. If most of students’ creative activity is performed in school, they are always doing in under time constraints and by their nature will search (even perhaps create) some sort of expectation that they need to meet (the latter particularly applies to our culture of students at Westminster). I have seen students buckle under the “pressure” to come up with an idea in class. This is partly because of the time constraint and the fear that they will not meet an expectation. They need to build confidence outside the classroom in their own abilities in order to be prepared for working creatively coming in the classroom. Although I do not grade students on creativity, we certainly will talk about it here and there. I do think that it’s important give students a healthy level of feedback in the creative process. We all need critics to keep us effective and relevant, especially if the point of our work is to communicate to a larger audience. Thanks for the thoughtful response Kim. I think you make a good point about “grades” and creativity. They don’t go well together. You can give someone feedback on their creative energy or output without “grading” someone. Ueland writes about the importance of receiving feedback on the creative process, but she makes a clear distinction that “critics” are generally people who come at things from a negative perspective (not her words but mine). I would totally agree that a healthy level of feedback on the creative process is important so long as it doesn’t diminish a student’s sense of self-trust that has built up over time. The high level of self-trust allows students to take risks which is an important part of being creative. At least I think so. What do you think?